Coast Salish Territories – Today, a Motion was brought to City Council to recommit to the vision of 100% welfare/pension rate social housing at 58 W Hastings, initially promised by former mayor Gregor Robertson. As project development went forward and it became clear that affordable housing for low-income community members was not a priority, women of DEWC have spoken out persistently and powerfully. To honour the strong voices of members, we’re sharing Power of Women Coordinator Harsha Walia’s letter to Mayor & Council. I am writing as Project Coordinator of the Downtown Eastside Women’s Center (DEWC) in support of Motion regarding 58 West Hastings Street. This motion calls for Vancouver City Council to recommit to the vision of 100% welfare/pension rate social housing as promised by former Mayor Gregor Robertson. Since 2008, members of DEWC have been mobilizing for the empty lot at 58 West Hastings to become a site of affordable social housing. Indigenous elders and women from DEWC, Beatrice Starr, Stella August, and Elaine Durocher lit the sacred fire with sweetgrass and sage that burned for the duration of the Indigenous and women-led tent city. 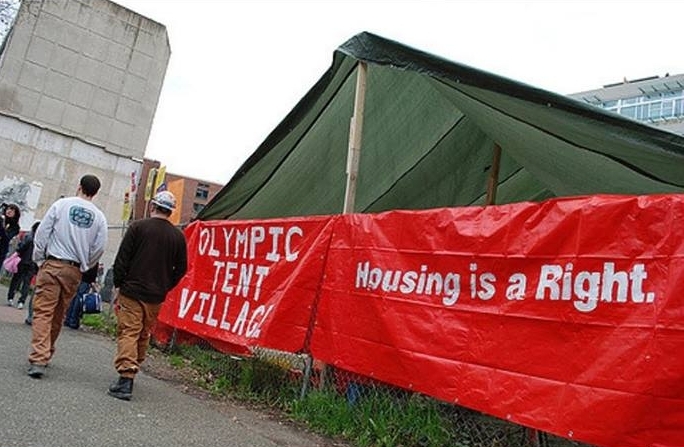 The first night brought out 80 DTES residents and homeless people, and the tent city gained support from 100 groups across the city. Today, as part of Our Homes Can’t Wait Coalition, our members continue to advocate for this site to be 100 percent social housing. I ask this Council to be a government that takes Annette’s words to heart, and to take on the responsibility to act in ways that values and centers Indigenous women’s voices, leadership, and inherent and constitutionally protected rights to safety and self-determination. Affordable housing is a necessary, foundational step to mitigate these violences, and Vancouver’s definitions of affordable housing must be changed to mean rates that are affordable to people on social assistance, and rents that are income-geared not market-geared. It is trite to repeat that homelessness is a crisis in this city. However, the specific gendered and colonial underpinnings of homelessness is often missing in how our City understands and imagines solutions to homelessness. 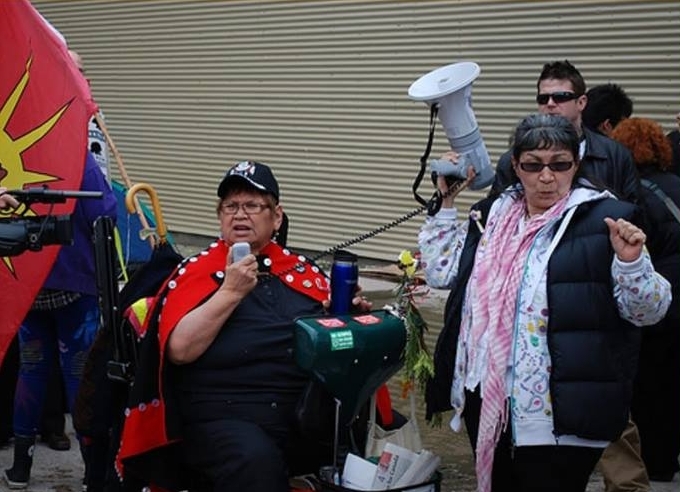 Indigenous women’s poverty in the DTES is one of the main factors magnifying vulnerability to abusive relationships, sexual assault, child apprehension, exploitative work conditions, unsafe housing, food insecurity, poor health, and social isolation. The poverty rate for Indigenous women is 36 percent, which is more than double the percentage of non-Indigenous women. Indigenous women are experiencing eight times more overdoses and five times more fatal overdoses than non-Indigenous women. In a DTES women’s safety audit, 87 percent of women reported feeling unsafe in the DTES, with 48 percent of women experiencing violence within the last two years, as well as 25 percent of women reported feeling unsafe in their place of residence. For Indigenous women, lack of safe and affordable housing compounds state and societal manufactured vulnerability. 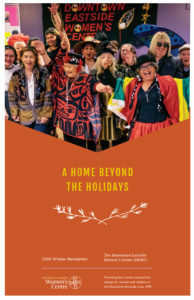 Indigenous women represent 45 percent of homeless women in the Metro Vancouver region, and all of DEWC’s Indigenous members have been homeless at some point in their lives. Indigenous women often have to make the impossible decision between staying in an abusive relationship (knowing that Indigenous women’s rate of violent victimization is more than triple that of non-Indigenous men), or becoming homeless and having their children apprehended. Today there are three times more Indigenous children forcibly removed from their parents and placed into foster care than at the height of the residential school era. Given the over-representation of Indigenous women living in extreme poverty and subjected to colonial gendered violence in this neighbourhood, it should be your absolute priority to provide safe and affordable housing to women in this community. This is especially true in light of all levels of government – federal, provincial, and municipal – committing to Reconciliation with Indigenous peoples, the UN Declaration on the Rights of Indigenous Peoples, the Convention for the Elimination of Discrimination Against Women, and recommendations from the Provincial Missing Women Commission of Inquiry. I urge you to find the money to ensure that 58 West Hastings is funded at 100 percent social housing. This means self-contained units available at welfare rates and that is large enough and suitable for women and their children. Social mix buildings, shelters with mats on a floor, and modular housing simply do not cut the basic requirements of dignified, safe and appropriate housing for Indigenous women and their families in this neighbourhood. Women in this community have a right to housing and need it to be affordable to match social assistance rates. For your reference, I am also attaching earlier letters from the Downtown Eastside Women’s Center and Union of BC Indian Chiefs calling for 100 percent social housing at 58 West Hastings. More information on how to support the community vision of 100% social housing at 58 W Hastings available via the Carnegie Action Project website.